Everest, the summit of Asia & the world. The seven summits, the highest peaks of the 7 continents! Trips, Statistics & information! In spring 2012 we will again offer an all inclusive trip on the Tibet side for only $41,190, via Lhasa! Here is all info about our upcoming 2012 expedition to Mt Everest for only $41,190! The bookingform is now online, so sign up here if you want to join. New: the prices for family, sponsors and friends who want to come to BC, ABC or Northcol! No refund if you cancel less than 90 days! Our expedition starts in Katmandu: we are all meeting in the Yak&Yeti 5***** hotel. Members arriving by different flights are met at the airport and brought to the hotel. The team will number 18-20 in all. A few days later we start for Tibet, by flying to Lhasa. We acclimaitse and see the famous Potala palace, before driving the the Everest region. We have one day of rest in Xegar for acclimatization and the next day we drive to Everest BC (5200m). After 2-3 days in BC we start with yaks to IBC (5800m). The next day we proceed to ABC (6400m) where we pitch a camp similar to our BC. there. 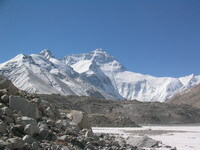 After that we start again for ABC – by this time our Sherpas will have established Camp 2 (7700m). So, we reach Camp 1 (North Col) and make an attempt to reach Camp 2. In case we cannot do this due to bad weather or the lack of acclimatization, we descend to ABC, have a short rest there, and try to reach 7700m again. 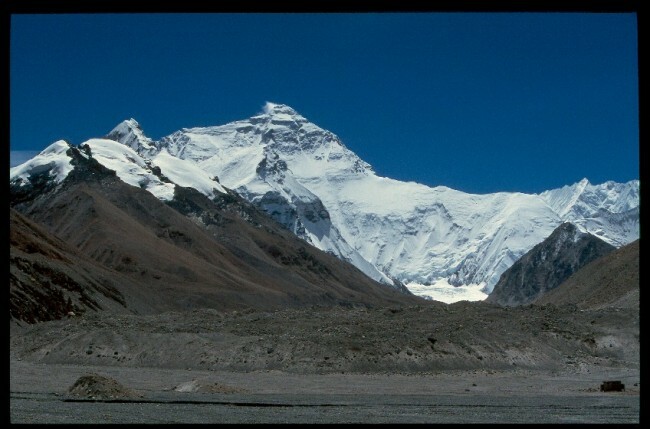 After one night at 7700m we go down to BC and have a long rest there. So by that time we will make three acclimatization outings. Meanwhile our Sherpas establish Camp 3 (8300m), after May 15-17 the whole team move to ABC and we wait there for a spell of good weather. And here your personal high altitude Sherpa – if you have chosen to hire one – comes in very handy, for he will carry your oxygen to the top (and help you down if need be). The only drawback is he will cost quite a sum. But certainly you will get a very good value for your money – at the bad concourse of circumstance it might be your life’s value. The advantage of our expedition is that in terms of weather it uses the best time: late May – early June. So we should return to Kathmandu on June 7 or 8. We stay at the Yak&Yeti again and leave it for home bringing a piece of Everest in our hearts. We plan to run this program every year, so, if you are interested, contact us for details. If you have some doubts about your being ready to try and climb Everest, then the best option for you is to try yourself on a less difficult and dangerous route: Everest North Col (7,000m). If you want to bring your family, they can join all the way to North Col! or ABC/BC, the following prices are all inclusive from Kathmandu. The 2 months’ programs means your relatives (or our sponsors) join the team for the whole program, so we all arrive and leave together. Joining the 1 month programs, your friends will have to leave earlier. Day 4 Flight from Katmandu to Lhasa (3650m) and transfer to hotel. Day 5 Day in Lhasa (3650m). Sightseeing: Potala Palace, Norbulinka Summer Palace & Metzekhang. Day 6 Driving to Xigatse (3900m), visiting Shalu Monastery and Tashilunpo in Xigatse en route. Personal travel, medical and rescue insurance. Climbing Everest is a dangerous pastime. No one can guarantee your safety at 7000m and much less at 8000m and over. So in our price we include personal high altitude Sherpa-guides for the summit attempt. According to our long Everest experience it is a must, especially if you have no previous experience in climbing above 8000m. A Sherpa-guide will enormously enhance your safety and chances of successful summiting. He will carry the supply of your oxygen to the top (and help you down if need be). The only drawback is he will cost quite a sum. But certainly you will get a very good value for your money – it might be your life’s value. High altitude Sherpas carry all expedition equipment above ABC. They pitch and strike high camps and bring up and down all the camping (including sleeping bags with foam pads), climbing gear, food and oxygen. The latter is brought to three camps: at 7000m (one 4-liters “Poisk” bottle per member), 7700m (one 4-liters “Poisk” bottle per member) and 8300m (three 4-liters “Poisk” bottles per member). Meals in the BC, IBC, ABC and the NCC– 3 times a day, prepared by Nepalese cooks with the help of Tibetan kitchen-boys on gas stoves in kitchen tents. In these camps you can get any amount of hot water for washing and boiled water for drinking. We eat in spacious mess tents equipped with tables and chairs. Food for the ascent – we provide special light-weight dehydrated food-stuffs made by western companies and in the camp higher the NC you make your meals yourselves on gas stoves. The cooking is simple, just add boiled water and wait a bit. Water is melted snow. There will be a doctor in BC. We provide a big expedition first aid kit with all the necessary first aid (only!) medicines, and we strogly recommend that you bring your own specific ones you think you might need. Medical insurance is a must! Weather on Everest is very changeable. Every day we will look for forecasts in Internet and adjust to them our planning of acclimatization and ascent. In BC and in ABC we organize 220V with the help of generator and 12V with Solar batteries. On the route we use radios with 144.00 frequency. All guides and Sherpas will have Walkie-Talkie. "Thuraya" satellite phone works fine evrywhere on the route. GPRS internet is pretty low. And everyone needs to work. To do this you have to buy UNIVERSAL GPRS modem (modem which is not connected with any particular mobile operator). Usually these modems have automatic setting for computers. In Lhasa you will have a chance of buying China SIM card with unlimited internet (about 100 USD) and then insert it into your GPRS modem or communicator. Thus you will have your personal Internet. On Everest climbers use 2 Base Camps – BC (5100m) and ABC (6500m).Hence it is advisable to have 2 sets of Base Camp equipment for Everest (e.g. – 2 sleeping bags so that you don’t have to carry your sleeping bag up and down).